An anthology of Tribe Records 1972-1977. Underground jazz and funk from Detroit collective of musicians that include Wendell Harrison, Phil Ranelin, Marcus Belgrave and others. Tribe as well as releasing records in the early 1970's also used to produce a black awareness magazine for Detroit. The CD includes articles from various editions of this magazine collated into a 50 page booklet. In the early 1970's Detroit was a city carrying with it the musical legacy of Motown as well as the title Motor City as one of the USA's main car manufacturing centres. But, by 1970 Motown had moved to Los Angeles and the city's car industry was in decline leaving Detroit in a cultural and industrial void. Out of this wasteland came Tribe. Over a five year period a group of creative jazz musicians from Detroit took control of their own lives by running their own label, Tribe Records, where they proudly put forward the message "Music is the healing force of the Universe." 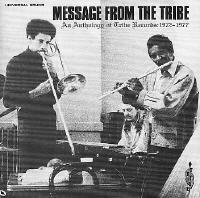 Message from The Tribe contains music from this label, a mixture of Funk and deep Jazz and comes with a 70 page booklet which reprints articles and photos from the original Tribe Magazine that was distributed in Detroit in the early 70's. There are features on Jesse Jackson, Sun Ra and Watergate! Tribe contains music by Wendell Harrison, Phil Ranelin, Marcus Belgrave, Doug Hammond and more.